Amos Bronson Alcott was born in 1799 in Wolcott, Connecticut, and though he was largely self-taught, he went on to become one of America's most influential educational reformers. After supporting himself as an itinerant salesman, Alcott began a series of teaching assignments that took him and his family to a series of schools in Connecticut, Pennsylvania, and Massachusetts. His pedagogical philosophy stressed the emotional and physical, as well as the intellectual development of children. He believed that learning was the result of dialogue between teacher and student. All the schools he established eventually failed, however, in part because of his "radical" educational theories--theories that do not seem so radical today. He thought that all children were created equal, in terms of moral and intellectual potentiality, and that circumstantial contingencies (which education might overcome) were responsible for inequalities in achievement. His educational theory, which stressed the organic growth of children and their close relation to their natural and social environments, was carefully conceived and surprisingly modern. Although he had a reputation for discarding all discipline for spontaneity, Alcott carefully organized the classroom and required full attention and good behavior on the part of the pupils at all times. He did, however, discard rote memory, common in his day, and concentrate on encouraging the natural development of the child's interest in the materials of geography, arithmetic, and grammar. His techniques resembled those of the Swiss educator, Johann Heinrich Pestalozzi, whom he deeply respected. Alcott published articles about his educational theory in William Russell's American Journal of Education and in the American Annals of Education and Instruction . Alcott went further in his Transcendentalist belief and held that children were born knowing right from wrong, and that it was the adult's duty to bring forth the child's innate goodness. Alcott asked children questions about God, life, and morality that were designed to help them find the answers within. Alcott was also good at spotting genius in children. He was one of those people who sincerely believed it was already there, within them, and he treasured it. In his classroom in the 1830s, he set aside time from the usual school subjects--geography, spelling, reading, and arithmetic--to have conversations with the pupils about the life of Jesus and about moral and spiritual topics. In 1834, Alcott opened a school for thirty pre-teenage boys and girls in The Masonic Temple in Boston. The founding of the Temple School in Boston was Bronson's most famous educational experiment. There he established an aesthetic environment conducive to learning and to stimulating to the imagination. He hired accomplished fellow Transcendentalists Elizabeth Palmer Peabody and Margaret Fuller as assistants. From their work came Bronson's controversial publication, Conversations With Children on the Gospels (1836 - 1837), in which he recounted dialogues with his pupils on the meanings of the New Testament. The children at the Temple School ranged in age from six to twelve years old. But do not let their ages fool you. The topics of these conversations on the gospels were probably meatier than most you would hear among students today--of any age. Alcott: What is praying sincerely? Alcott: What is to be done in praying the truth? When you think of prayer, do you think of a position of the body--of words? Lemuel: (earnestly) I think of something else, but I cannot express it. Josiah: (burst out) To pray, Mr. Alcott, is to be good, really . . . and to be good to God alone, because then we are good for goodness' sake, and not to be seen, and not for people's sake. Well, so it is with prayer. There must be nothing outward about prayer; but we must have some words, sometimes; sometimes we need not. If we don't feel the prayer, it is worse than never to say a word of prayer. It is wrong not to pray, but it is more wrong to speak prayer and not pray. We had better do nothing about it, Mr. Alcott! We must say words in a prayer, and we must feel the words we say, and we must do what belongs to the words. Alcott: Oh! There must be doing, must there? Josiah: Oh! yes, Mr. Alcott! Doing is the most important part. Josiah was six years old. Lemuel, a little older. What they and the others had to say in these conversations is priceless. The conversations on the gospels, however, despite their high importance, and despite the claim of Alcott's opponents to the contrary, actually constituted a somewhat minor activity at the Temple School. The major activity--as is true for any school--was that of education in the obvious sense of teaching such core subjects as reading, writing, and arithmetic. Nevertheless, Alcott imparted his unique mark in this area as well. Unlike other educators at the time, Alcott read and discussed poems and stories with the children, often centered on the meaning of words. Alcott was aware of the active nature of children, and there were exercise periods for the youngsters. He used the Socratic method to draw out the basic truths which he thought lay in the recesses of every child's mind. Furthermore, Alcott tried to develop a "common conscience" in the children by having all the students participate in the selection of punishments for individuals. Sometimes, the whole class was punished for the behavior of one individual. He refused to strike children, and on occasion he went so far as to have the misbehaving individual strike him to demonstrate the social effects of individual misbehavior. Rather than punishment, Alcott brought joy into his schoolrooms. He invited an artist to teach art and musicians to teach their craft. He instituted exercise, the first school library, student government, and more. Students, parents, and savvy educators praised Alcott, but, unfortunately, others weren't ready for his ideas--and he subsequently lost all of his infant schools. His free-thinking treatment of religious issues with its personalized view of Jesus shocked, as did his insistence on color-blind enrollment of students. He accepted a mulatto girl in 1839, and when angry parents demanded that he dismiss this "black child" he adamantly refused. Consequently, parents withdrew their children to other schools, and the Boston school folded with Alcott all but bankrupt. One might argue that children these days are just too restless, too easily distracted, more interested in frivolous amusements than in exploring meaningful subjects. Why make the effort? Bronson Alcott thought better. So did Jesus. Jesus was displeased when people held children back. He told his disciples not to forbid them from coming to him, "for of such is the kingdom of God" (Mark 10:14). That says a lot about the timeless things that do interest children, and about their real nature--unselfish, brimming with spirituality, expressive of love and intelligence. For all of us, in fact, no matter what our age, these same "kingdom of God" qualities need to be valued and nurtured, not ignored or suppressed. From 1859 to 1864 Alcott served as Superintendent of Concord Schools. In 1879, mainly through the support of his Western admirers, Alcott's lifelong dream for a School of Philosophy in Concord was fulfilled. This later school, the Concord School of Philosophy, was located at the rear of the side yard toward the left of Orchard House. 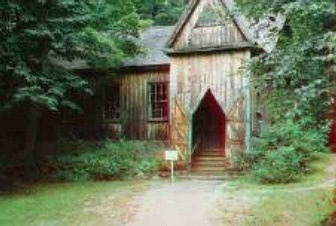 One of the first summer schools for adults, the Concord School of Philosophy continued for nine summers and closed in July 1888 with a memorial service to Alcott who had passed away on March 4 of that year. The building is now an open forum summer school for adults. By Amos Bronson Alcott, from his School Superintendent's Report, published in the Concord Town Report for 1860 - 1861. The following excerpt is from Concord Magazine on the Web. Editor's Note: Children are now required to meet ever-rising academic standards, and at the same time are finding themselves with less free time to play in a non-organized and unscheduled manner. This includes the growing trend to discontinue a period of recess during the school day. In light of this, we thought it would be useful to hear from this Concord educational progressive who helped institute play as an important and valuable part of the curriculum. Keep in mind that he was presenting an alternative to the more strictly regimented and highly disciplined norm at most other schools. Young people find ways enough of amusing themselves and we best leave them much to their choice in such matters; yet some slight superintendence seems becoming--some interest shown by us in their pleasures--since these exert a commanding influence in forming their tastes and characters, and cannot be safely neglected by their guardians. They are a school for the fancy and the heart; they may play the part of the school of virtue or of scandal, as well or ill chosen. The streets are the gymnasia of the young, the world they live in largely, the widest, the freest range they know and are permitted to enjoy. Herein are they fairly launched into life, and left free to follow their inclinations--masters of themselves for the time, and servants of their senses and devotees. 'Let us play' is the privileged version of their creed, and they enter with the unction of enthusiasm into the sweet sports they love. Then they show what they are; casting all reserve aside their souls leap sunward glossy gay into the in abandonment to fancy and fun. And now is the teacher's golden opportunity for learning the temper, and tendencies of these enthusiasts at their pastimes outside. Nor need his presence mar their sports. Any indifference to these matters shows some defect of sensibility and an unfitness for his task. A teacher should have much good company in him and tact in making himself as agreeable out of doors as inside. . . .
Education is that process by which thought is opened out of the soul, and, associated with outward . . . things, is reflected back upon itself, and thus made conscious of its reality and shape. It is Self-Realization. As a means, therefore, of educating the soul out of itself, and mirroring forth its ideas, the external world offers the materials. This is the dim glass in which the senses are first called to display the soul, until, aided by the keener state of imagination . . . it separates those outward types of itself from their sensual connection, in its own bright mirror recognizes again itself, as a distinctive object in space and time, but out of it in existence, and painting itself upon these, as emblems of its inner and super-sensual life which no outward thing can fully portray. . . . A language is to be instituted between [the child's] spirit and the surrounding scene of things in which he dwells. . . . He who is seeking to know himself, should be ever seeking himself in external things, and by so doing will he be best able to find, and explore his inmost light. To contemplate Spirit in the Infinite Being, has ever been acknowledged to be the only ground of true Religion. To contemplate Spirit in External nature, is universally allowed to be the only true Science. To contemplate Spirit in ourselves and in our fellow men, is obviously the only means of understanding social duty, and quickening within ourselves a wise Humanity.-- In general terms, Contemplation of Spirit is the first principle of Human Culture; the foundation of Self-education. This principle, Mr. Alcott begins with applying to the education of the youngest children. Considering early education as a leading of the young mind to self-education, he would have it proceed on the same principles. . . . Instead, therefore, of making it his aim to make children investigate External nature, after Spirit, Mr. Alcott leads them in the first place, to the contemplation of Spirit as it unveils itself within themselves. He thinks there is no intrinsic difficulty in doing this, inasmuch as a child can as easily perceive and name pleasure, pain, love, anger, hate and any other exercises of soul, to which himself is subjected, as he can see the objects before his eyes, and thus a living knowledge of that part of language, which expresses intellectual and moral ideas, and involves the study of his own consciousness of feelings and moral law, may be gained; external nature being only made use of, as imagery, to express the inward life which he experiences. Connected with this self contemplation, and constantly checking any narrowing effect of egotism, or self complacency, which it may be supposed to engender, is the contemplation of God, that can so easily be associated with it. For as the word finite gives meaning to the word infinite, so the finite virtue always calls in the mind, an Idea which is henceforth named, and becomes an attribute of the Eternal Spirit. Thus a child, having felt what a just action is, either in himself or another, henceforth has an Idea of Justice, which is pure and perfect, in the same ratio, as he is unsophisticated; and is more and more comprehensive of particular application, as his Reason unfolds. How severe and pure it often is, in a child, thousands have felt! . . . The first object of investigation is also in the highest degree fruitful for the intellect. Spirit, as it appears within themselves, whether in the form of feeling, law, or thought, is universally interesting. No subject interests children so much as self-analysis. To give name to inward movements of heart and mind, whether in themselves or others, is an employment of their faculties which will enchain the attention of the most volatile. There is no one class of objects in external nature, which interests all children; for children are very differently gifted with respect to their sympathies with nature. But all are conscious of something within themselves which moves, thinks, and feels; and as a mere subject of curiosity and investigation, for the sake of knowledge, it may take place of all others. In order to investigate it, a great many things must be done, which are in themselves very agreeable. Mr. Alcott reads, and tells stories, calculated to excited various moral emotions. On these stories, he asks questions, in order to bring out from each, in words, the feelings which have been called forth. These feelings receive their name, and history, and place in the moral scale. Then books, and passages from books are read, calculated to exercise various intellectual faculties, such as Perception, Imagination, Judgment, Reason (both in apprehension and comprehension); and these various exercises of mind are discriminated and named. There can be no intellectual action more excellent than this, whether we consider the real exercise given to the mind, or its intrinsic interest to the children, and consequently the naturalness of the exercise. And its good influence with respect to preparing for the study of Science is literally incalculable. There is not a single thing that cannot be studied with comparative ease, by a child, who can be taught what faculties he must use, and how they are to be brought to bear on the subject, and what influence on those faculties the subject will have, after it is mastered. Mr. Alcott re-commenced his school in Boston, after four years' interval, September, 1834, at the Masonic Temple, No. 7. Believing that the objects which meet the senses every day for years, must necessarily mould the mind, he felt it necessary to choose a spacious room, and ornament it, not with such furniture as only an upholsterer can appreciate, but with such forms as would address and cultivate the imagination and heart. In the four corners of the room, therefore, he placed upon pedestals, fine busts of Socrates, Shakespeare, Milton, and Sir Walter Scott. And on a table, before the large gothic window by which the room is lighted, the Image of Silence, "with his finger up, as though he said, beware." Opposite this gothic window, was his own table, about ten feet long, whose front is the arc of a circle, prepared with little desks for the convenience of the scholars. On this, he placed a small figure of a child aspiring. Behind was a very large book-case, with closets below, a black tablet above, and two shelves filled with books. A fine cast of Christ, in basso-relievo, fixed into this bookcase, is made to appear to the scholars just over the teacher's head. The bookcase itself, is surmounted with a bust of Plato. . . . The desks for the scholars, with conveniences for placing their books in sight, and with black tablets hung over them, which swing forward, when they wish to use them, are placed against the wall round the room, that when in their seats for study, no scholar need look at another. On the right hand of Mr. Alcott, is a sofa for the accommodation of visitors, and a small table, with a pitcher and bowl. Great advantages arise from this room, every part of which speaks the thoughts of Genius. It is a silent reproach upon rudeness. About twenty children came the first day. They were all under ten years of age, excepting two or three girls. I became his assistant, to teach Latin to such as might desire to learn. Mr. Alcott sat behind his table, and the children were placed in chairs, in a large arc around him; the chairs so far apart, that they could not easily touch each other. He then asked each one separately, what idea he or she had of the purpose of coming to school? To learn; was the first answer. To learn what? By pursuing this question, all the common exercises of school were brought up by the children themselves; and various subjects of art, science, and philosophy. Still Mr. Alcott intimated that this was not all; and at last some one said "to behave well," and in pursuing this expression into its meanings, they at last decided that they came to learn to feel rightly, to think rightly, and to act rightly. A boy of seven years old suggested, and all agreed, that the most important of these three, was right action. Simple as all this seems, it would hardly be believed what an evident exercise it was to the children, to be led of themselves to form and express these conceptions and few steps of reasoning. Every face was eager and interested. From right actions, the conversation naturally led into the means of bringing them out. And the necessity of feeling in earnest, of thinking clearly, and of school discipline, was talked over. School discipline was very carefully considered; both Mr. Alcott's duty, and the children's duties, also various means of producing attention, self-control, perseverance, faithfulness. Among these means, punishment was mentioned; and after a consideration of its nature and issues, they all very cheerfully agreed, that it was necessary; and that they preferred Mr. AIcott should punish them, rather than leave them in their faults, and that it was his duty to do so. Various punishments were mentioned, and hurting the body was decided upon, as necessary and desirable in some instances. It was universally admitted that it was desirable, whenever words were found insufficient to command the memory of conscience. After this conversation, which involved many anecdotes, many supposed cases, and many judgments, Mr. Alcott read "The Peaches," from Krummacher's fables, a story which involves the free action of three boys of different characters; and questioned them respecting their opinion of these boys, and the principles on which it was seen by analysis that they acted. Nearly three hours passed away in this conversation and reading; and then they were asked, how long they had been sitting, none of them thought more than an hour. After recess Mr. Alcott heard them read; and after that, spell. All could read in such a book as Miss Edgeworth's Frank. Each was then asked what he had learned, and having told, they were dismissed one by one. The whole effect of the day seemed to be a combination of quieting influences, with an awakening effect upon the heart and mind. . . . It was soon found that Mr. Alcott, with all his mildness, was very strict. When sitting at their writing, he would not allow the least intercommunication and every whisper was taken notice of. When they sat in the semicircle around him, they were not only requested to be silent, but to appear attentive to him; and any infringement of the spirit of this rule, would arrest his reading, and he would wait, however long it might be, until attention was restored. For some time, the acquirement of this habit of stillness and attention was the prominent object; for it was found that many of the children had very little self-control, very weak attention, very self-indulgent habits. Some had no humility, and defended themselves in the wrong; there was some punishment, consisting of impression upon the body (on the hand); but still, in every individual instance, it was granted as necessary, not only by the whole school, but, I believe no bodily punishment was given, without the assent of the individual himself, and it was never given in the room. In many of the punishments--in the pauses of the reading, for instance--the innocent were obliged to suffer with the guilty. Mr. Alcott wished both parties to feel that this was the inevitable consequence of moral evil in this world; and that the good, in proportion to the depth of their principle, always feel it to be worth while to share the suffering, in order to bring the guilty to rectitude and moral sensibility. On these occasions, he conversed with them; and, by a series of questions, led them to come to conclusions for themselves upon moral conduct in various particulars; teaching them how to examine themselves, and to discriminate their animal and spiritual natures, or their outward and inward life; and showing them how the inward moulds the outward. They were deeply interested in these conversations, as they would constantly declare; although, at first, those, who were very often revealing to themselves and others their hitherto unrecognized weaknesses and faults, were so deeply mortified, that it was often painful. The youngest scholars were as much interested as the oldest, and although it was necessary to explain language to them rather more, it was found less necessary to reason on moral subjects. They did not so often inquire the history of an idea, or feeling; but they analysed the feelings which prompt action better. It was very striking to see how much nearer the kingdom of heaven (if by this expression is meant the felt authority of moral principles), were the little children, than were those who had begun to pride themselves on knowing something. We could not but often remark to each other, how unworthy the name of knowledge was that superficial acquirement, which has nothing to do with self-knowledge; and how much more susceptible to the impressions of genius, as well as how much more apprehensive of general truths, were those who had not been hackneyed by a false education. . . .
January 14: He proceeded to the word type. What is a type? said he. One boy said, a type is a metal letter which is used to stamp a sign upon paper. What is a word the sign or type of? said Mr. Alcott. They severally said, of a thought; of an idea; of a feeling; of an object; of an action; of a quality. Language, said Mr. Alcott, is typical of whatever goes on within us, or is shaped out of us. What is the body a type of? Of the mind. What is the earth a type of? Of God; mind; heaven; were the several answers. I would go on much farther, said Mr. Alcott, if there was time. There are people who think and say, that the world and outward things are all; because they do not know what they are typical of. I could show you that all outward things are produced out of those spiritual realities, of which they are types. But the clock now typifies the hour of recess: and you may go out. . . .
February 2: Birth was the first word. Mr. Alcott remarked that we had once before talked of birth, and their ideas had been brought out. Now I am going to speak of it again, and we shall read Mr. Wordsworth's Ode. He then asked the youngest child present, how old he was, and found he was four. The oldest was twelve. He said, that little boy, in four years, has not had time to make that comparison of thoughts and feelings which makes up conscious life. He asked those who understood him, to hold up their hands. Several held up their hands. Those who do not understand these words, may hold up their hands. A great many of the younger ones held up their hand. Wordsworth had lived, when he wrote this ode, many years, and consequently had felt changes, and he expresses this in the lines I am about to read. . . . He here stopped, and asked why Mr. Wordsworth could not see the things which he had seen before; had they changed, or had he changed? He had changed, said a boy of ten. Have you had any degree of this change? Yes, and more in this last year, than in all my life before. Mr. Alcott said he thought that there were periods in life, when great changes took place: he had experienced it himself. He then said: but let us all look back six months; how many of you look at things, and feel about them differently from what you did six months ago? How many of you feel that this school-room is a different place from what it was the first week you were here? Almost every one, immediately, with great animation, held up his hand. He then asked those who knew why this was, to hold up their hands. Many did. And when called on to answer, they severally said, because we know more, because we think more, because we understand you, because you know us, because you have looked inside of us. Mr. Alcott said, the place is very different to me; and why? They gave similar answers; but he said they had not hit it. At last one said: because we behave better. Yes, said he, you have it now; knowledge is chaff of itself; but you have taken the knowledge and used it to govern yourselves, and to make yourselves better. If I thought I gave you knowledge only, and could not lead you to use it, to make yourselves better, I would never enter this school-room again! . . .
Mr. Alcott called the class to analysis, for the last time. He said we had now gone through the scale; but it had often been changed since we began, for almost every week had improved it. . . .
We began with Love; and then went to Faith; and then to Conscience, speaking of Obedience, Temptation, and Will; and then to the Appetites, Affections, and Aspirations of the Soul; and then we went to Mind, and spoke of Imagination, Judgment, and Insight. . . . He here stopped and said that one of the boys in this school had said that he did not know before he came to this school, that he had inward eyes; but now he felt that they were open. They began to guess who it was, but they did not guess the right one. Mr. Alcott said that many of them, when they came, were blind, were in midnight. And then he went on reading different passages of the Gospels. He ended with, the light of the body is the eye; what eye? This eye, said a little boy of five. That is the body's eye; what is the spirit's eye? That eye which can see every thing that it wants to see, and which can see God; the body's eye cannot see what it wants to, but the spirit's eye can; and Mr. Alcott, I think that when we are asleep, the spirit goes out of the body, and leaves the body dead; and bye and bye it goes back again, and makes the body alive again. But is the body entirely dead, in sleep? said Mr. Alcott. Why, perhaps a little spirit stays in the body to keep it alive. But almost all the spirit goes out, and sees and hears with its inward eyes and ears, and that is dreaming. . . .
Who think that we must know ourselves, in order to know God? All. Who thinks he cannot know God, till he knows himself a great deal? All. Who think that they can know God by studying outward things? None. What are outward things? Shadows of inward things, said the little girl, who was generally the subject of analysis. The Representation of Mind, said a boy of nine. Who was called the Image of God? Jesus Christ, said the whole school. Yes, the outward world is the image of the perfect Mind; and Jesus Christ was the Image of God; or his nature was all Spirit, as he said. Who think that until we study ourselves, we cannot study outward things to much advantage? Many. Mr. Alcott then remarked that many naturalists who never studied themselves, but studied outward things, did not believe in any spirit; and some who believed in spirit, yet did not think it was the most important, and did not therefore believe in Christianity, or what Jesus Christ taught about spirit. Others have gone out into the Outward world, thinking it a shadow of the inward, and followed on until they found the Spirit that was in themselves, and God. One boy said, if I study botany, can I go from it and find God? Mr. Alcott explained, but I could not hear him, as he walked to a place, where he stood with his back to me. . . . I intend you shall learn outward things too: I shall get people to come and tell you about many outward things, which I do not know much about myself. I can teach better about the inward things. Next quarter I am going to teach you about inward things, not in yourselves, but in another--a Perfect Being. In Jesus Christ? asked some. Yes; we will study Jesus Christ; how many will be glad to do this? They all held up their hands. How many have learned something from the analysis--they are very sure; they know it? Almost all held up their hands. How many are sorry these lessons are over? Several. Some said they were glad the next subject was coming. Who would like to hear the Record of the Analysis read? All. Mr. Alcott then recurred to the blackboard, and said he would read the scale. This diagram had been altered, many times, during the quarter. It was intended merely to systematize the conversations in a degree; and never was presented to the children as a complete map of the mind. Some have objected to these diagrams, as if they would be fetters on the minds of the children. But their constant renewal and changes preclude the possibility of their being regarded as any thing but what they are. After having read the scale through, he began at the end asking the meaning of each word, and as they were defined, he obliterated them, until all were gone. It may seem to some persons rather out of place, to bring philosophy to bear upon taking care of babies. But here is the starting point of education. . . . The principles growing out of the few primal facts of human nature which are stated above, carried out into the whole education--this is Mr. Alcott's system. He would teach children to discriminate spiritual happiness from that bodily ease and enjoyment, which too often takes its place: to cherish the principle of love, by feeding it on beauty and good, and not on illusion; and to clarify and strengthen faith, by getting knowledge in the right way; not by accumulation, but by growth; for there is something at foundation of the human soul, analogous to the organization of a plant, which does indeed feed on the earth from which it springs, the air in which it flourishes, the light of heaven which comes upon it from afar; but which admits nothing that it cannot assimilate to itself. We may assist a plant, if we will study its nature, but there are things which might be put round one plant, which would destroy another. And so we may assist a soul; but there is only one way. We must study its nature; we must offer the individual those elements alone, which it needs, and at the time it needs them, and never too much, and always enough. Then we shall find that each soul has a form, a beauty, a purpose of its own. And we shall also find, that there are a few general conditions never to be shut out: that, as the light of heaven, the warmth of earth, and space to expand, are necessary to the plants; so knowledge of God, the sympathy of human love, and liberty to act from within outward, are indispensable to the soul.